RadarSync's PC Updater 2012 offers an easy-to-use and comprehensive solution for updating your PC's drivers. The application quickly scans for and identifies the out-of-date drivers lurking on your computer, and makes installing the newer versions a cinch, but getting PC Updater running takes a little longer than it should. RadarSync PC Updater's interface is attractive, but a bit bland. The delay is due to all of the extras that RadarSync offers you while installing the software. I declined its invitations to install a Babylon toolbar, to change my default search engine to Babylon.com, and to change my home page. Then, I opted out of its suggested installation of an app called "I Want This." Ditto for an app called "We-care," from Save the Children. And ditto for an app called "ComplainApp." By the time I was able to run PC Updater, I'd almost forgotten which app I'd initially wanted to install. But once it began running, I was able to forget about the installation annoyances. PC Updater automatically began scanning my computer, and promptly presented me with a list of 24 outdated drivers than needed updates. Free rival SlimDrivers identified half of that number, but that doesn't automatically mean PC Updater's results are superior. SlimDrivers grouped some drivers together, while PC Updater broke each individual item out in its list. If you choose to update these items, the end result is the same: All of the outdated drivers are current. RadarSync PC Updater did, however, identify a few drivers that rival products missed. It identified a few out of date BlackBerry drivers on my system, from a smartphone that I no longer use. Some folks may see this additional item on the list as an annoyance--after all, if I were still connecting the phone to the PC regularly, the driver likely would have been updated at some point. But I like PC Updater's comprehensive approach. I was less impressed with its bland user interface. Rivals PerfectUpdater and Driver Reviver ($30 each) both offer handy icons that tell you, at a glance, whether your outdated drivers are old, very old, or ancient. PC Updater's text-heavy results list was not as easy to scan. Installing the drivers in question is a breeze, though, as PC Updater handles all the necessary steps--including creating a System Restore point and a backup of the existing driver--automatically. 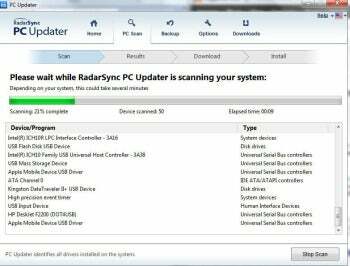 Radar Sync's PC Updater is comprehensive and easy to use. If you can live with its installation hassles and text-heavy interface, you'll find it worthwhile. A comprehensive, complete tool for identifying and updating outdated drivers, RadarSync is a keeper.